The first few weeks of a new year can feel like the start of something fresh and exciting, but for many U.S. residents, this is merely the halfway point. Winter is just beginning, and several states have already seen record-breaking low temperatures. Meanwhile, the West Coast has been rocked with wild fires, mudslides, earthquakes, and drought. We recommend reviewing your emergency preparedness plan often, particularly with changing seasons that can bring extreme weather conditions. 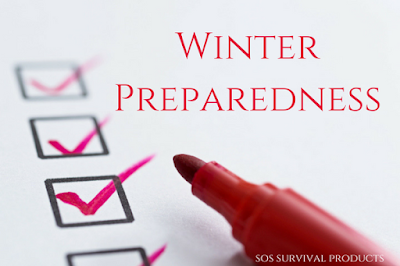 Let's examine some steps you can take to keep you and your family prepared this winter. When extreme weather is in play, there's no such thing as over-preparedness. Facing conditions below freezing can mean the difference between a snow day and a disaster situation, particularly if other factors such as power outages are involved. In general, winterizing your home keeps energy costs low, but in the event that you've lost power, the additional insulation adds vital protection against the cold. Keeping a small generator on hand – and the fuel to run it – will allow you to power a space heater, the effect of which can be amplified through the use of cheap solar blankets. If your home has a fireplace, use it. However, ensure that you know how to build and tend a fire in advance. If you plan on using a fireplace or wood burning stove, make sure that it’s clean and ready for use. Never leave a fireplace unattended. Ensure your car is stocked with antifreeze, windshield washer fluid, oil and gas, and that everything in your car is working as expected. If you don’t already have winter tires, then it’s time to upgrade them. Don't leave pets outside under any circumstance. Winterize your home & car. Invest in a windshield scraper. Keep a battery-powered weather radio on hand in the event you lose power. Map out and practice your safety evacuation route. Consider marking a map with a preferred and secondary route as well as safe locations. Keep your emergency kit fully stocked. Ensure you have alternatives such as firewood or a generator for keeping warm. 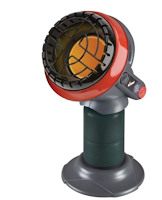 A small heater such as this uses a propane tank and can accommodate a 100 sq. ft. area. Make extra blankets and warm clothes readily accessible. Bring animals indoors and provide adequate shelter and blankets to livestock. Not all parts of the country are affected by extremely low temperatures. For any emergency situation, you and your family should have a plan of action in place. For example, determine who is going to carry important documents, how you'll load the car and which route you'll be taking in case of an evacuation. It’s important that in addition to your own family plan, you are also aware of your town’s evacuation plans and routes. Sort out the chain of command, meeting places, and other important details for ensuring your family sticks together. Run practice drills with your family, particularly if you have younger children. Keep a list of important contacts and other information readily available for any disaster situation. That includes the police, fire department, insurance, utility service companies, and loved ones. If you or anyone in your family takes medication, be sure to keep a detailed list of what they take, how much, and why. Make sure that important documents, like birth certificates and property deeds, are kept in a fireproof safe so they can survive any disaster. Keep your emergency kits stocked and go-bags ready and up to date. Stock at least three gallons of water per person. If you have pets, make sure you create an emergency action plan to ensure their safety in case of a disaster. Account for additional water your pet will need. Stay up to date on weather alerts with local stations or an emergency weather radio. If you’re one of the tens of millions living in an earthquake-prone area, we recommend practicing readiness frequently. Earthquakes can escalate quickly, causing heavy objects around you to fall. It’s as important to avoid these spaces during an earthquake as it is to secure items prior to such an event. Practice drills are vital when preparing for an earthquake. Find safe places in each room of your house. Be prepared for how you’d react to an earthquake in your workplace, at a friend’s house or in public, and talk to your children about what they should do away from home. The CDC recommends that you drop to your hands and knees immediately if an earthquake starts. Crawling is safer than running as it eliminates falls and potentially serious injuries. stronger the shelter you find to hide under, the better. Before an earthquake, take precautions by protecting your home by securing heavy items that could topple over. Consider organizing your shelves so that larger, heavier, and breakable items are closest to the floor. Secure items on your walls, such as pictures or mirrors. Know how to shut off your gas valve. Every person in your home can benefit from a flashlight by their bed at night. Stock an emergency radio to keep you updated in the event of a power failure. Map an evacuation route and practice evacuating with your family. Keep an emergency kit stocked and on hand. Establish your safe places for cover at home, workplace, and/or school – practice DROP, COVER, and HOLD ON in your safe places. Ensure you have home insurance protecting your assets. Regularly trim foliage and other flammable objects around your property. Clean your gutter and roof of dried leaves or anything that might work as kindling. Consider building walkways and other “fuel breaks” to stop wildfires from spreading to your home. Set aside any tools that could be used to help extinguish a fire. This includes rakes, shovels and buckets. Water down your roof so it’s less likely to catch fire. Keep an extra-long garden hose around that can stretch to any part of your house and property. Fill garbage cans, the bathtub, and any other large container with water. If you can afford to, consider installing a pool or pond in your yard – any extra water source will help protect your home. Keep your windows, doors, and vents closed. Shut off anything pulling air in from the outside so that the air inside stays clear of smoke and dust. Shut fireplace screens and open the dampers if you have a fireplace. Stay tuned into your radio for updates. Evacuate if you're advised to. Make sure that your car is ready for an evacuation – the tank is full, there’s an emergency kit, and extra clothes in the car. Check appliances that could be explosive when exposed to fire and take the necessary precautions.